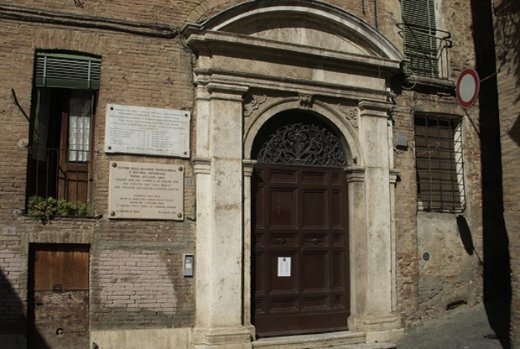 September 12, 1999, Sunday afternoon in Siena ; the synagogue at Via delle Scotte 14 was closed. The usual Sunday tours had obviously been cancelled, for it was the second day of Rosh Hashana, the Jewish New Year. There had certainly been a service in the morning but no more tours of the synagogue would take place until the following week - too late for me. My spiritual thirst would have to remain satisfied by the biblical iconography of the Gothic and Renaissance painters I saw in the Museum of the Duomo and in the Pinacoteca Nazionale, both a short walk away. Notwithstanding Dante’s remark in Canto XXIX of Inferno (in Charles Sisson’s translation) ‘And I said to the poet : “Now was there ever / A people so frivolous as the Sienese ?/ Certainly not the French, by a long way ! "’, one finds there, quite simply (perhaps I should say quite complicatedly), some of the greatest art in the world : Duccio, Petrarch’s friend Simone Martini, Beccafumi. Fixed for ever in oil paint, those images of biblical figures gave me a fix. For a time. On March 29, 1799, four days after occupying Florence, French troops occupied Siena, set up a democratic republic and emancipated the Jews. With this act of liberation, the glory days had finally arrived (in the words of the Marseillaise), as promised by the French Revolution, or so the Jews of Siena must have thought. 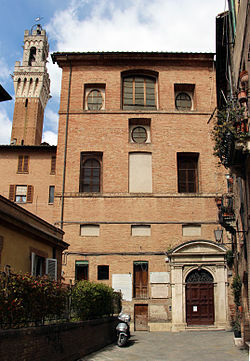 Three months later, anti-Revolutionary peasant forces from the nearby town of Arezzo plundered the ghetto - which had been set up in 1571, fifty-six years after Italy’s first one, in Venice - and desecrated the synagogue (built in 1756) during the retreat of the Revolutionary troops after Napoleon’s Italian campaign. What happened in Siena was part of the reactionary religious backlash against the granting of basic human rights associated with the Revolution. The countryside was getting back at the cities. The mob, known as Viva Maria (after their slogan), did more than plunder and desecrate. On the wall by the synagogue door there is a bicentenary plaque to the victims of the "anti-Jacobin and Jew-hating reactionaries of Viva Maria who burned alive thirteen Jews in the Piazza del Campo on June 28, 1799". There is another plaque, put up in 1948, to the memory of fourteen Jews deported by the Nazis in 1944. They were aged from thirteen to seventy, "children of a doctrine of justice and love", carefully chosen words whose truth and irony also apply to the earlier catastrophe. Easy to say, I know, shocking too, and at the same time absurd, but I find myself wishing that, if there had to be freelance autos-da-fe and deportations to death camps, the same number of Jews had died both times. To accuse me, to accuse myself, of aestheticizing death would, I think, be unfair. My wish is more like a mythographical imperative, comparable to the traditional Jewish ascription of the ninth day of the Hebrew month of Av as the date when many historical disasters are said to have happened. Most of the old ghetto was pulled down during slum clearance in 1935. But one street, Via delle Scotte, remains. This particular afternoon, a few doors up from the synagogue, on the left hand side, a door stood half open. I could not resist taking a look. What I found was an artist’s workshop, a place of bits and pieces, of shreds and patches. The thinnest man in the world was standing inside ; perhaps he was a bricoleur making a living from his odds and ends, or a conceptual artist reconstituting this and that into a new thing or idea across the time and space of an ancient city. I thought of those Jews living in fear and trembling, 200 years ago. Smiling, the man invited me in. In a mixture of French, English and Italian, we struck up a conversation. I learned that beneath the ground floor of the seventeenth-century house there were three more storeys, just as one can see several storeys above from outside. He took me downstairs. He said that there had once been an underground city in Siena, a honeycomb of basements and sub-basements just like his own. It was cold and dark, even in late summer, just as it would have been in June 1799 with Viva Maria on the rampage. My imagination went into overdrive : I saw the mob dragging a Jew out of this very house. We returned to the ground floor. I walked across to a door at the back of the house. It opened on to a tiny medieval passageway at the side of the synagogue, invisible from the street. I thanked the young man for his hospitality, said goodbye and went back to the synagogue where I felt the need to make a futile gesture, and knocked loudly on the door. Then I eyed the bell labelled "Synagogue" and above it another one labelled "Professor Lattes". It was one thing to look behind a half-open door, but my traveller’s chutzpah, my need for a fix, did not extend to ringing a complete stranger’s bell, one who might be observant, even though we certainly had friends in common if he was the Lattes I thought he was. It was time to leave Siena, an exceptionally beautiful and once great city, frozen in time since the Black Death - when so many died, including great painters like the Lorenzetti brothers - and the rise of Florence as a rival power. There is a short story or painting hiding in that house, waiting to emerge, like children hiding in a cupboard. Like Graziella Nissim and her cousin Ferruccio Valech, aged fourteen and thirteen, on June 28, 1799, hiding in the basement of a house they had been visiting, a few doors from their synagogue. Only three months earlier, they had cheered and cheered when the French troops arrived in Siena and liberated the ghetto. No more yellow badges ! During the liberation, their parents explained to them that this was a historic moment, and the rabbi took the opportunity to give his flock a lesson or two in Jewish history and in the faith of their ancestors. Who knows, perhaps he used the phrase "a doctrine of justice and love", and perhaps the phrase survived in some diary or other, to be recycled nearly 150 years later in the wording of the plaque to the victims of Nazism. Little did he or the other Jews know on that joyous March day that shortly they would learn a very different lesson in Jewish history and faith. Indeed, on the fifteenth day of Sivan, corresponding to June 18, the rabbi instituted and all present celebrated a festival, a "special Purim", as is the custom after a deliverance. Viva Maria were successfully resisted in Florence and Leghorn. But on June 28 in Siena, the reactionary forces from Arezzo forced the French garrison to capitulate and then proceeded to terrorize the ghetto. Some were done to death in the synagogue. Axe marks are still to be seen in the doors of the Holy Ark. Others were burned alive on the toppled Tree of Liberty, the Revolutionary symbol in the Campo, which had been planted there at the liberation of the town in March. When it seemed safe to emerge from hiding, Graziella and Ferruccio went straight to the synagogue, where they found Graziella’s older sister. In tears, she told them that their mother and Ferruccio’s grandfather had been among the thirteen Jews burned alive. She said that all the victims had cried out the Shema in their agony. On the following Sabbath, the rabbi took as his text for commentary the Book of Zechariah. Quoting the prophet (chapter 9 verse 12), he told his anguished community : "Return to the stronghold, you prisoners of hope." He went on to say that if hope were to be abandoned, Judaism would be dead and the victims would have died in vain. Let it die, he thought that night, but swiftly silenced the thought. Later, a fast day was instituted on June 28 each year. In 1944, Graziella Nissim and Ferruccio Valech were deported to Auschwitz. "We are born with the dead", T. S. Eliot wrote in "Little Gidding" (Four Quartets was published in 1944), and also "History is now and England." From another point of view, "History is now and Siena". 12 septembre 1999, dimanche après-midi à Sienne : la synagogue du 14, via delle Scotte était fermée. Les habituelles visites dominicales avaient de toute évidence été annulées, car c’était le second jour de Rosh Hashana, la nouvelle année juive. Une célébration avait dû se dérouler le matin, mais aucune visite n’aurait lieu avant la semaine suivante – trop tard pour moi. Il faudrait que ma soif spirituelle se satisfasse de l’iconographie biblique des peintres de l’époque gothique et de la Renaissance dont j’avais vu les œuvres au musée du Dôme et à la Pinacothèque nationale, tous deux à deux pas. En dépit de la remarque de Dante au Chant XXIX de l’Enfer (dans la traduction d’Henri Longnon) : « Fut-il jamais, dis-je alors au poète, / Peuple plus vain que les Siennois ? / Pas même les Français : il s’en faut de beaucoup ! », on trouve ici, tout simplement (peut-être devrais-je dire en toute complication), quelques-unes des œuvres les plus grandes au monde : Duccio, l’ami de Pétrarque Simone Martini, Beccafumi. Fixées à l’huile pour l’éternité, ces images de figures bibliques m’enchantèrent. Pour un temps. Le 29 mars 1799, quatre jours après avoir occupé Florence, les troupes françaises s’emparèrent de Sienne, y établirent une république démocratique et émancipèrent les Juifs. Avec cet acte de libération, les jours de gloire (selon l’expression de la Marseillaise) avaient fini par advenir, comme promis par la Révolution française, tout du moins comme ont dû le penser les Juifs de Sienne. Trois mois plus tard, les forces paysannes antirévolutionnaires venues de la ville voisine d’Arezzo pillèrent le ghetto, fondé en 1571, cinquante-six ans après la fondation de celui de Venise, le premier en Italie, et profanèrent la synagogue (bâtie en 1756) tandis que les troupes révolutionnaires se retiraient à la fin de la campagne napoléonienne d’Italie. Ce qui advint à Sienne fait partie de la réaction religieuse brutale, contrecoup de l’accès aux droits civiques fondamentaux associés à la Révolution. La campagne prenait sa revanche sur les villes. La troupe des assaillants, connue sous le nom de Viva Maria (d’après leur slogan), ne se contenta pas de piller et profaner. Sur le mur, près de la porte de la synagogue, se trouve une plaque, apposée pour le bicentenaire, en hommage aux victimes des « réactionnaires de Viva Maria, antijacobins et antisémites, qui brûlèrent vifs treize Juifs sur la Piazza del Campo, le 28 juin 1799 ». Une autre plaque fut placée en 1948, à la mémoire des quatorze Juifs déportés par les Nazis en 1944. Ils avaient de treize à soixante-dix ans, « enfants d’une doctrine de justice et d’amour », mots soigneusement choisis, dont la vérité et l’ironie s’appliquent également à la catastrophe antérieure. Facile à dire, je sais, choquant également, et absurde en même temps, mais je me surprends à regretter que, s’il fallait qu’il y eût des autodafés spontanés et des déportations en camps de la mort, la mort n’eût pas touché à chaque fois le même nombre de Juifs. M’accuser, m’accuser moi-même, d’esthétiser la mort, serait, je crois, injuste. Mon regret ressemble davantage à un impératif mythographique, comparable à cette tradition juive qui date du neuvième jour du mois hébreu d’Av nombre de catastrophes historiques advenues. La majeure partie de l’ancien ghetto fut détruite durant la démolition des taudis, en 1935, à l’exception d’une seule rue, la via delle Scotte. Cet après-midi-là, à quelques pas de la synagogue, sur la gauche, une porte demeurait entrebâillée. Je ne pus résister à l’envie d’y jeter un coup d’œil. C’est un atelier d’artiste que je trouvai, endroit fait de bric et de broc, jonché de fragments épars, où demeurait l’homme le plus maigre au monde. Peut-être s’agissait-il d’un bricoleur* gagnant sa vie en récupérant des choses et d’autres, ou un artiste conceptuel créant à partir de vestiges légués par le temps dans l’espace d’une antique cité. Je songeai à ces Juifs vivant dans la crainte et le tremblement il y a deux cents ans. En souriant, l’homme m’invita à entrer. Dans un mélange de français, d’anglais et d’italien, nous entamâmes la conversation. J’appris que sous le rez-de-chaussée de la maison du dix-septième siècle, se trouvaient trois autres étages, tout comme ceux qu’on voit de l’extérieur au-dessus. Il me fit descendre. Il m’expliqua qu’il y avait jadis eu à Sienne une ville souterraine, un rucher de sous-sols à plusieurs niveaux, comme chez lui. Il y faisait froid et sombre, même à la fin de l’été, tout comme, on pouvait le penser, en juin 1799, alors que se déchaînait Viva Maria. Mon imagination s’échauffa : je vis la foule extirper un Juif de cette maison même. Nous regagnâmes le rez-de-chaussée. Je traversai la maison pour atteindre une porte, à l’arrière, qui donnait sur une minuscule ruelle médiévale longeant la synagogue et invisible de la rue. Je remerciai le jeune homme pour son hospitalité, pris congé et retournai à l’édifice où je ressentis le besoin d’un geste futile : frapper fort à la porte. Ensuite je vis la sonnette étiquetée « Synagogue », surmontée d’une autre, pour le « Professeur Lattès ». Une chose était de jeter un coup d’œil par une porte entrouverte, mais mon chutzpah  de voyageur, mon besoin d’enchantement, n’allèrent pas jusqu’à sonner chez un complet étranger, qui pouvait être observant, même si nous pouvions avoir des amis en commun s’il était le Lattès que je supposais. Il était temps de quitter Sienne, ville exceptionnellement belle, et grande autrefois, figée dans le temps depuis la Mort noire,– époque à laquelle moururent tant d’hommes, de grands peintres y compris, comme les frères Lorenzetti –, et l’ascension de Florence comme puissance rivale. Une nouvelle, ou un tableau, se dissimulent dans cette bâtisse, attendant de sortir, comme des enfants cachés dans un placard. Comme Graziella Nissim et son cousin Feruccio Valech, âgés de quatorze et treize ans, le 28 juin 1799, et qui se cachaient dans le sous-sol d’une maison où ils se trouvaient en visite, non loin de la synagogue. A peine trois mois plus tôt, ils avaient acclamé avec joie les troupes françaises entrées dans Sienne et libérant le ghetto. Plus d’insignes jaunes ! Durant la libération, leurs parents leur expliquèrent qu’il s’agissait d’un moment historique et le rabbin saisit l’occasion de donner à ses ouailles quelques petits leçons d’histoire juive et de foi ancestrale. Qui sait ? Peut-être utilisa-t-il l’expression « une doctrine de justice et d’amour », et peut-être celle-ci survécut-elle dans quelque journal intime pour se voir reprise presque cent cinquante ans plus tard lors de la rédaction de la plaque aux victimes du nazisme. Ni lui ni les autres Juifs ne se doutaient, en cette joyeuse journée de mars, qu’ils s’apprêtaient à apprendre une leçon très différente en matière d’histoire juive et de foi. Et même, le quinzième jour de Sivan, correspondant au 18 juin, le rabbin institua et toux ceux qui étaient là célébrèrent une fête, un « Pourim spécial », comme le veut la coutume après une délivrance. La résistance à Viva Maria l’emporta à Florence et à Livourne. Mais le 28 juin à Sienne, les forces réactionnaires d’Arezzo contraignirent la garnison française à capituler et s’employèrent à terroriser le ghetto. Certains furent mis à mort dans la synagogue. On voit encore des marques de hache sur les portes de l’Arche sainte. D’autres furent brûlés vifs sur l’arbre, abattu, de la Liberté, le symbole révolutionnaire sur le Campo, planté lors de la libération, en mars. Quand il leur parut sans danger de sortir de leur cachette, Graziella et Feruccio se rendirent directement à la synagogue, où ils trouvèrent la sœur aînée de la fillette. En pleurs, cette dernière leur apprit que leur mère et le grand-père du garçon faisaient partie des treize brûlés vifs, ajoutant que toutes les victimes avaient dans leur atroce douleur hurlé le Shema Israël . Le Sabbath suivant, le rabbin choisit de commenter le Livre de Zacharie. Citant le prophète (chapitre 9, verset 12), il dit à sa communauté emplie d’angoisse : « Retournez à la forteresse, vous prisonniers de l’espoir. » Il poursuivit en disant que si l’on abandonnait l’espoir, le judaïsme s’éteindrait et les victimes seraient mortes en vain. Qu’il meure, pensa-t-il cette nuit-là, mais très vite tut sa pensée. Par la suite, on instaura un jour de jeûne chaque année le 28 juin. En 1944, Graziella Nissim et Ferruccio Valech furent déportés à Auschwitz. « Nous naissons avec les morts », écrivit T.S. Eliot dans « Little Gidding » (les Quatre Quatuors furent publiés en 1944), et également : « L’histoire, c’est le présent et l’Angleterre. » D’un autre point de vue, « l’histoire, c’est le présent et Sienne ». Cet article fut publié pour la première fois dans le TIMES LITERARY SUPPLEMENT le 17.12.1999. Mot yiddish signifiant « culot, audace ». « Ecoute Israël » : prière fondamentale de la foi juuive.